I was planning to simply take a good oatmeal chocolate chip cookie recipe I've made in the past and fit some cornflakes into it but I stumbled upon this recipe in my research and it fit right into the cookie I envisioned eating. I'm glad I used it! I like using old-fashioned oats because I love the chew it adds and I really want that to be prominent. If you prefer, you can use quick oats instead. It bears repeating that you should add the cornflakes into the batter, then let the paddle of your stand mixer mix it in and break up the cornflakes into smaller pieces. Going in, I was a little hesitant and wondering if the cornflakes should be crushed or not. Now that I've made them, I discovered that breaking them up a bit turns the cornflakes into ideal little bits within the cookie that add a bit of crunch and a slight sweet flavor that we really enjoyed. Have you had cookies with cornflakes? How does it compare with rice krispies? I need to try that next, and hopefully, soon. Preheat oven to 350 degrees and set racks in the upper and lower third position. Line baking sheets with parchment paper or silicon baking mats. In the bowl of a stand mixer fitted with the paddle attachment, cream butter together with the sugars. Add milk, egg, and vanilla extract. Mix until combined, scraping the bowl as needed. In a separate bowl, lightly whisk the flour, baking soda, baking powder, and salt together. Add this to the mixing bowl and beat until combined. Add oats and cornflakes and beat on low-speed to incorporate (you want to break the cornflakes up into smaller pieces). Stir in the chocolate chips with a rubber spatula. Scoop cookie dough into about 2-tablespoon mounds (or as desired) onto the baking sheets, spaced about 2 inches apart. Bake for 10 minutes, rotating pans midway, until cookies are set and the sides are golden. Remove baking sheets to wire rack and let cool a few minutes before transferring cookies to the rack to cool completely. Not really a fan of cornflakes, but I love the idea of using them in the cookies. Thanks for sharing, Monica. Yum! Adding cornflakes is a brilliant idea and I love that added crunch to the cookie (: Have you ever tried coating french toast in cornflakes? It's a delicious layer of crunch, and I love it. The first time I had it was at Walker Brothers, a breakfast restaurant, and it was so good! What an idea you've given me, Monica! You know I think I've seen it on menus and I definitely remember seeing a Captain Crunch version but I'm pretty positive we've never had it! Mmmm...another box of cereal might be in the works. Thanks, Monica! How nice! Never tried this with cornflakes (like you, we don't really have them in the house) but I know we would all love them. I definitely like a 'crunch' to a cookie. They look delicious too. Have a great rest of the weekend Monica. I am all gaga for texture in my food, even more so than the rest of my family. This was a fun excuse to make cookies, Jo! : ) Talk soon! Hi Monica, I bet the corn flakes brought a different texture to the cookies, you really are a great baker. I bet these are delicious. You're too kind, Cheri. The cornflakes did do this funny thing to the cookies - I enjoyed the hint of crunch and caramelization. These cookies look and sound delicious- cornflakes are such a fun addition :) Pinning! Thanks for pinning, Medha. Cookies are just great things, aren't they? Ha! There are an infinite number of reasons to make cookies! I've had loads of success using rice krispies in cookies, but I haven't hit on the perfect corn flake cookie recipe yet. Maybe this is it! Yes, so true and I'm glad for it! I really want to try the rice krispies in cookies! I assume it will be an even airier kind of crunch. Nice!! these chocolate chip cookies are lovely! Pinning them right away! I love cornflakes and the idea of adding them in cookies sounds interesting.They look so beautiful and Delicious! I'm totally glad I did it. They were tastier than I expected. Hope you try it one day. I love the crunch part of these chocolate chip cookies. I like crunch in so many things, too, Bal. 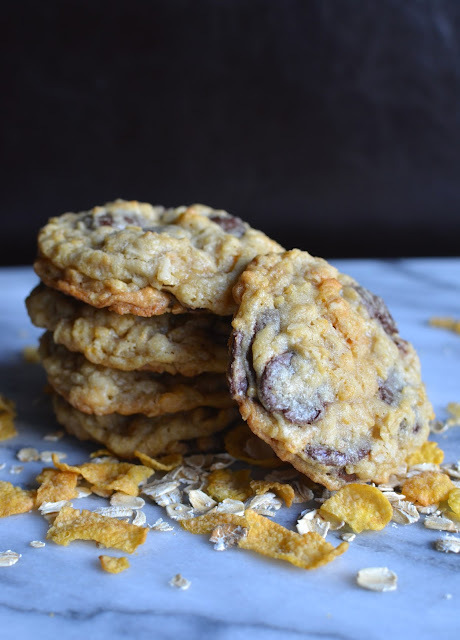 I'm glad you showed me the way with this cornflake chocolate chip cookie recipe because I never would have thought to combine them! In love! I love, love chocolate chip cookies! These ones scream my name! A warm homemade chocolate chip cookie is such a wonderful treat, isn't it?! Oatmeal cookies are my favorite and I can just imagine that the cornflakes add such a nice crunch! I can't wait to try that next time:) They look perfect! Hi Kelly - thanks for taking the time to check in here. Hope all is well and you're not too busy. The cookbook will be amazing, no doubt!